This conclusion to the so-called 'Eastrail 177 Trilogy' is unevenly structured, but a return of familiar faces and some fine performances help to bring this M. Night Shyamalan's tale to an exhilarating close. Nearly 20 years since his breakout hit The Sixth Sense, there has always been a big question mark raised when a new M. Night Shyamalan movie is released in cinemas: is it any good? It’s a simple question that any film critic must answer when reviewing movies, but with the recent resurgence that Shyamalan has had with his previous two films, 2015’s The Visit and 2017’s Split, it’s one that always gets asked due to a back catalogue that is poisoned by some truly awful movies (The Last Airbender will never be forgotten). Now with Glass, there has never been more hype for a Shyamalan movie since After Earth as fans were left astonished by the brief appearance of Unbreakable’s David Dunn (Bruce Willis) during Split’s ending, revealing that both films exist in the same universe. It is Shyamalan’s answer to Marvel’s Avengers, and despite the film’s misgivings, it is a somewhat satisfying conclusion to this trilogy. Picking up three years following the events of Split, David is using his superpowers to fight crime as a vigilante known as ‘The Overseer’. After a thrilling encounter with multi-personality serial killer Kevin Wendell Crumb, they are both whisked off to a psychiatric hospital headed by Dr Ellie Staple (Sarah Paulson) who deals with patients claiming to have super powers. It’s also revealed that David’s nemesis Elijah Price (known as Mr Glass) resides in Staple’s hospital and holds secrets that are critical to both men, whilst possibly masterminding something greater. From first impressions, there is no denying that Shyamalan has been incredibly ambitious with this film. Watching on an IMAX screen, there is plenty of visual grandeur to admire with the inventive use of camera angles during the exciting action set pieces or the immersive sound design when faint running footsteps can be heard all around you during an intense standoff. It’s an example of filmmaking that utilises how cinema can immerse audiences and it shows how he has thought about the filmgoing experience as well as the events onscreen. Most of the film’s first half is situated within the hospital as Dr Staple tries to persuade all three men that their beliefs in their super powers are a fantasy, which is an interesting premise to begin with. Unfortunately, it seems that Shyamalan has written himself into a corner as the script tries to give a plausible argument as to why our three main heroes might just be ‘normal’ people, leading to some daft coincidental explanations. It’s surprising to watch Shyamalan attempt to deconstruct the world he has made but in a manner that reads as cheap fan-fiction and not as the architect of his creation. It also does not help that Dr Staple is a character that is constantly pessimistic and is always on hand to spill out plot exposition as though viewers are somehow newcomers. As Kevin cycles through his personalities during one of Staple’s sessions, she patronisingly explains each personality in thorough detail as though audiences haven’t watched Split beforehand, which is injustice to the film’s target audience and very tedious to watch. However, despite the film’s weak beginning, it gradually begins to improve as the latter half plays out towards the end. Samuel L Jackson is rightfully the film’s main star and he plays Glass with all the swagger and menace as before in Unbreakable. He’s a terrifically engaging screen presence with his purple pin up suit and messy afro and although the script is cheesy, Jackson knows this and makes it believable to us. Bruce Willis, whilst slipping back into David Dunn effortlessly and providing one of his best performances in recent memories, doesn’t have plenty of screen time on hand but it’s still wonderful to catch up with Dunn after so many years, and James McAvoy once again reprises the role of Kevin with as much conviction and malevolence as he showed in Split. It’s three actors all at the top of their game. There’s also a much welcomed change of pace later on compared to the film’s slow and ponderous first half and even though the cliche plot is fairly predictable to an extent, the film itself knows this and uses it to its advantage to make a sly comment on the superhero genre (even throwing some shade at the biggest studio of them all). It stops the film from sliding into typical blockbuster fare and it does allow the director to implement his famous trademark that, for once, felt rewarding and immensely gratifying. But most importantly, even when it feels like the narrative is about to shatter, I was still emotionally invested with these set of memorable characters that I’ve come to know and love over the course of these three instalments. It’s a reminder as to why Shyamalan was hailed as Hollywood’s saving grace during the turn of the century before he torched it, as he understands the fundamentals of creating distinctive characters that actors and audiences can both love and cherish for generations to come. He always strives for originality with his movies and never plays it safe so whilst Glass does compromise with its ambitions, it’s certainly another step towards redeeming his tortured career. Whether he can keep this consistency up is anyone’s guess, but this definitely gives some hope for the future. Well done Shyamalan! 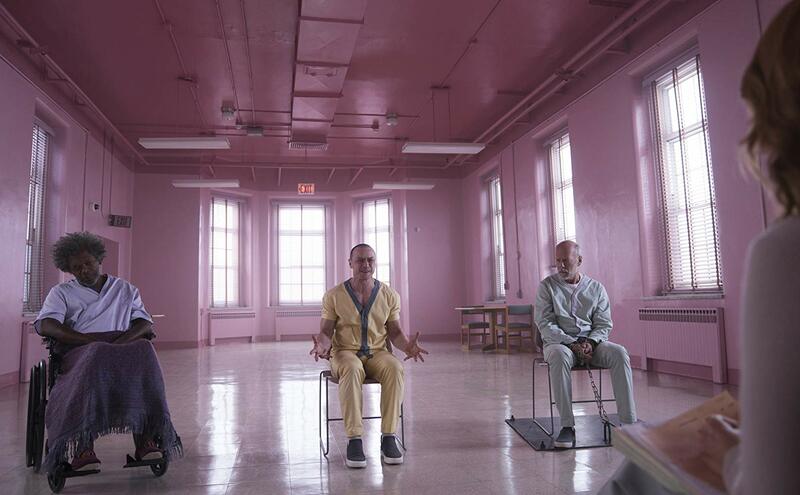 Glass, directed by M. Night Shyamalan, is released in the UK by Walt Disney Studios Motion Pictures, certificate 15.